Below you will find 10 important travel recommendations, general recommendations and practical tips to improve your safety while traveling through Peru. This information has been collected through my own experience of more than 14 years of traveling in Peru and South America. Read about the country you plan to visit, especially about the current situation in the areas where you’d like to travel. Important information includes knowing about the current political situation, the weather (rainy season), local health risks, such as Dengue, Malaria, Zika, etc., and natural disasters like flooding’s, landslides and even earthquakes. Besides that, it’s also important to know about the local culture and the places you want to visit. Make sure you have a list with all the important contact phone numbers and addresses, including your insurance company, credit card companies, banks, personal doctor, embassy, travel organization, family, etc. Send digital copies/pictures of important papers like passport (and later also a picture of the immigration stamp! ), your visa, your insurance documents, etc., to your e-mail address. This way you will always have access to this information, even if your entire luggage is lost or stolen. Deposit most of your money in a savings account, so even if your cash or credit cards are lost or stolen, robbers can’t access the money in your savings account. Make sure that there is always someone who knows where you’re going and how you can be reached in case of an emergency. Learn at least some basic Spanish. Especially when you travel to less touristic areas of these countries, many people don’t speak any English. Even in very touristic areas such as Cusco, Uyuni, and Galapagos, most policemen and doctors don’t speak English, and in case of an emergency you don’t always have time to look for those who do. It may seems like an obvious recommendation… but experience has taught me that travelers in Ecuador, Peru and Bolivia often don’t look after their belongings. Maybe they feel at home after a couple of days of traveling and forget to be careful. They loose sight of their backpacks, cameras, or smartphones and make it very easy for thieves to steal them. Enjoy yourself, but keep track of your belongings at all times. So when it’s too quiet on the streets there is probably a good reason for this, but when it’s too busy you also have to be very careful. Many tourists get stolen when they walk into a protest march, join a crowd to watch a show, or stroll over a busy market. Try to avoid places with too many people and if you do have to pass through, then try to keep your valuables near your body, or at least in sight. Don’t keep anything in back or side pockets and if you have a shoulder or backpack with you, then keep it on your chest, with your arm around it. Avoid poor neighborhoods, both in dark and also during daytime. Avoid surely the so called “Red Zone”, between the Andes and the Amazon rainforest. This area is where they grow coca for the production of cocaine… At the moment of writing Peru produces more raw materials to make cocaine than Colombia. 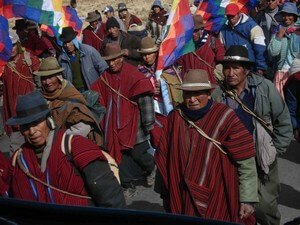 Demonstrations, protests and road blocks are not uncommon in Peru, but usually aren’t aimed against tourists. However, it is still better to avoid these political activities, because you never know if/when they can escalate into aggression. Flying stones and tear gas don’t make a difference between protesters or tourists. In case you do have to pass a road block, for example to catch a flight, make sure to always stay calm and friendly. Try to show sympathy for their cause, even if you don’t agree with them. A few friendly words in Spanish can also be helpful. If you can avoid it, try not to pass any road blocks by yourself, but travel with other Peruvians and try to blend in with them. Alright, we know that for a tall western person it isn’t always easy to blend in with the shorter Peruvians. But when you dress casual, not wear obvious jewels and behave like you belong where you are, then you make yourself way less of a target for pickpockets and robbers then when you act like an obvious tourist… Of course, be also careful with carrying big (video) cameras around your neck. Do not walk aimlessly around, even when you don’t know where you are, just pretend you do. The best protection against getting robbed is always when no-one knows that you carry anything of value with you. Even small shops in Peru use the same concept. 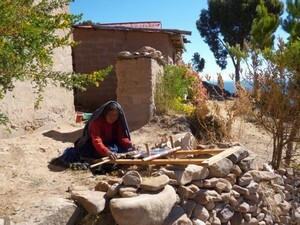 Because it is very expensive to hire a security company to transport money in Peru, it is common for small shops to bring money to the bank with the help of a casual dressed man or woman with a small backpack, or even a strong plastic groceries bag. They easily blend in in the crowd on the streets and no-one will expect that they carry a few thousand US$ with them. Always carry a small wallet with some pocket money with you if you want to buy things in the market, or on the streets. Make sure never to take money out of your money belt when in public. After taking money out of an ATM it is best to return directly to your hotel. Even if you don’t leave the money in your hotel, if anyone was observing you, they expect that you left the money and lose interest in you. Also travelers who like to sit with their laptop on a terrazzo are recommended to first return back to their hotel, before wandering of into the city. Because there are many ATM Cash machines spread all over Peru, there is no need to bring a lot of cash with you. Just in case of an emergency and/ or when one of the cash machines doesn’t work, take around 200,- US$ in cash with you in small bills of 5, 10 and 20 US$. US$ are widely accepted in Peru, but the bills can’t be broken and have to be clean. You can leave your money and passport in the safe of your hotel and officially in tourism we always have to recommend this. But most hotels in Peru are actually quite safe and there’s often a bigger risk to forget you valuables in the safe when you have an early departure, than that they get stolen from the room. Of course it is important that you never leave any valuable things in plain sight, but to put them in a backpack or suitcase with a small lock on it. Even if the cleaning ladies can be trusted, they do often keep various rooms open at the same time when they’re cleaning and then it’s very easy for anyone who passes the room to walk in and out… In 14 years of traveling in Peru and South America, I never left my valuables in any safe and nothing has been stolen from me so far. The bus services in Peru are good and even better than in many western countries. Now I can already hear some travelers who want to disagree with this statement. Maybe some of them will even show you pictures of busses where you can see the road through holes in the floor of the bus… Yes, indeed, there are also still many busses like that operating in Peru, especially in the cities in the north where there’s less rain. However, when you travel from city to city there will often be a wide range of bus services to choose from. You can choose the very cheap options, which are often badly maintained and have just one driver who drives for more than 10 hours, or you can choose for one of the better companies with well-maintained busses and 2 drivers that switch each 4 hours. Some routes now even offer busses with seats that go down to 180 degrees! For long distances, especially when you travel at night, I highly recommend to pay a little more. This extra money isn’t just for more comfort, but also for extra security. The cheaper bus companies often don’t respect the Peruvian safety rules for transport. In comparison to the amount of bus companies and daily bus rides in Peru, luckily there aren’t many bus accidents, but when they happen, they often involve the cheaper bus companies and a driver who fell asleep, or who drove too fast… La Cueva bus company, between Lima, Nasca and Arequipa is one of these companies that you better avoid. A bus company called Soyus, along the same route even gives its passengers a piece of paper to warn them that they have to watch their belongings, because there is a lot of theft on these busses. Better bus companies have 2 drivers, change their drivers about each 4 hours, have their speed constantly checked by satellite, the passengers are filmed and these busses only stop at special stops designed for these bus companies, where people who get into the bus first get checked. All of this to avoid getting the wrong people on the bus and make the journey safer. 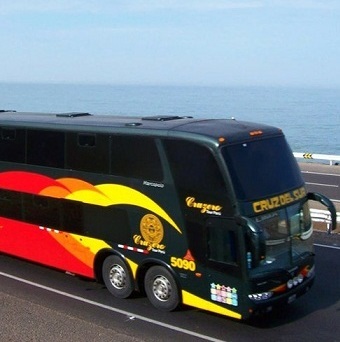 Some good bus companies in Peru include: Cruz del Sur Bus, this company has the best client service and technically speaking also the safest busses. It is the only bus company in Peru which has an international ISO 39001 safety certificate. Other good bus companies in Peru include: Oltursa Bus, Ittsa Bus, Movil Tours, TRC and 4M. Other recognized bus companies but with a big difference in quality between their different bus services include: Linea Bus and Chiva Bus. Trust your feeling. If you don’t like the driver, then just choose another taxi. Taxi’s at airports and bus terminals in Peru unfortunately often try to charge too much and there are still no taxi’s with meters. To give you an idea about some taxi prices, the normal price for a taxi from the airport in Lima to the Miraflores district is between 15 to 20 US$ for the taxi. 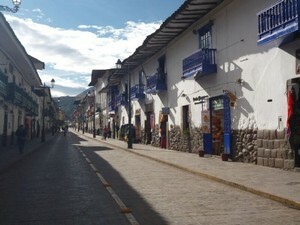 In Cusco a taxi from the airport to the center of Cusco is even just only 3 to 5 US$. A good trick to get a cheaper safe taxi is to wait until a taxi arrives with clients to drop off and then take this same taxi. Usually these drivers quickly want to leave the airport or bus terminal again, so are more likely to give a good price. It might sound bad and negative and I am sure there will again be people who disagree with this statement, but 14 years of travel experience has thought me that it’s better not to be too trustful. Of course this doesn’t mean that most Peruvians are unreliable, the warning counts more for the Peruvians that you might encounter while traveling through Peru. Besides that you don’t have to feel bad about not trusting the Peruvians, because they often trust you as a foreigner even more than their own neighbor. When you behave normal a police officer in Peru will never ask you anything. So when a policeman in Peru stops you on the street and asks for your passport, or anything else there’s a big chance that this isn’t a real policeman… One thing you can do is to pretend very friendly that you have no idea what he wants, because you speak no Spanish at all. If he speaks some English, or you speak some Spanish, you can also just show him a color copy of your passport and tell him that the original is in the safe in your hotel. If he wants, you can walk (don’t just get into a (police)car, with him to your hotel to show your original passport. Do not exchange money on the streets. There’s quite a lot of fake money around in Peru, so it’s better to try to get most money you use from ATM’s. If you do want to exchange money, then ask at 3 or 4 official exchange offices for the current exchange rate and pick out the best one. Most official exchange offices mark their Soles (local currency) bills with a small stamp as a proof that you exchanged your money at their office. Exchange rates at banks are often very bad. Do not trust anyone you meet when going out. The men and women who make easily contact with you often do so, because they have a lot of experience with this. Unfortunately their goal is often not just to have a fun evening… If you think that the man or woman that’s interested in you is really interested in you, then agree to meet the next day for a coffee or meal in a neutral place and see if they show up. Don’t take them to your hotel room and never tell them where you sleep, because knowing which hotel you have doesn’t only allow them to keep an eye on you, but can also give them an idea of how much money you have to spend. Never show you Peruvian love or friends that you have money and surely don’t pay everything for them. Real love and friendship doesn’t have to be bought and sincere Peruvians are often even too proud to accept anything from you. It sounds very obvious, but still many tourists get robbed when distracted. Never trust a person who comes up to you with a roll of toilet paper right after someone else accidently spilled mayonnaise, coffee, or anything else on your clothes (really still happens). If you have the feeling that someone tries to distract you, then continue in a firm pace in a straight direction, or enter a big shop that isn’t crowded and wait a few minutes before you leave. In the past 6 years somehow it became very popular to use Ayahuasca while visiting Peru. Even some tour agencies now offer so called “Ayahuasca Retreats”, or “Spiritual Tours” to earn some extra money. Although I personally don’t believe in the usefulness of these ceremonies, who am I to judge. However, from experience, I do know that you have to be very, very careful with using this substance. It’s a strong natural drug and as with any drugs it is dangerous when you use it the wrong way. It isn’t uncommon that people end up with psychological problems and in both Peru and Ecuador the use of Ayahuasca has even caused the death of a tourist… If you want to use either Ayahuasca, or San Pedro then make sure that you know the risks and that you use it around people you trust.